The carob tree is one of the most ancient flora species of Earth. It is usually found in dry areas and is characteristic of the eastern Mediterranean countries. It is abundant in Cyprus and its fruit has been widely used by the locals since the old days, even in its raw form when there was nothing else to eat, or after processing as a basis for preparing traditional delicacies. One of these is the carob-toffee (“pastellaki haroupomelou”). It is extremely healthy as it is rich in vitamins A, B1, B2, calcium, magnesium, iron. In the recipe that follows it is used in a very modern and intercultural way by integrating the traditional Cypriot carob-toffee to the international muffin! :: Preheat the oven at 180 degrees Celsius. :: In a blender beat 100gr flour with 100gr carob-toffee until it becomes like powder. :: Combine the rest of the flour, B.P., vanilla and cinnamon. Add the butter and mix until it resembles crumbles. Stir in the carob-toffee mixture. :: In the blender beat the milk with the eggs. Pour in the dry mixture and fold. 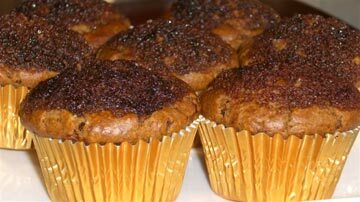 :: Spoon the batter in muffin cases decorating the top with a small piece of carob-toffee. :: Bake for approx. 20 minutes. Marilena Joannides. B.Sc(Econ), MBA and over 20 years experience in sales and marketing. Has a passion in research on Cyprus culinary culture, aiming to preserving it by integration into today’s lifestyle. Produced a documentary reviving forgotten traditional delicacies. Organises unique events with the purpose of promoting Cyprus gastronomy.